In Paraguay, the climate is subtropical, with very mild winters from mid-May to mid-August (which are dry in the north-west and rainy in the south-east) and long and very hot summers from November to March, with possible showers and thunderstorms in the afternoon throughout the country. However, given that the country is exposed to different air masses, it can experience rapid changes in temperature. The country is in the Southern Hemisphere, so the seasons are reversed in comparison with North America or Europe. In the northwestern part of the country, sparsely populated, we find the region called Chaco Boreal, ie the northern part of the Gran Chaco, a plain occupied by savannah, which extends into the neighbouring countries, i.e. Brazil, Argentina and Bolivia, while the central-eastern part is more humid and often marshy. The rains increase proceeding from the north-west to the south-east: the driest area is the Gran Chaco, where precipitation drops below 1,000 millimeters (40 inches) per year, while the rainiest area is that of the Paraná River, covered by forests, where annual precipitation approaches 2,000 mm (80 in). The main differences in the rainfall are found in winter, which is dry in the Chaco and rainy in the south-east of the country; so, the south-east, being rainy even in winter, has no dry season. During winter, in fact, the eastern and southern parts of the country are affected by weather fronts, which usually spare the north. Spring and autumn are rainy as well. However, the rains in countries having a tropical or sub-tropical climate are irregular: weeks may well pass without rain, and then heavy showers or downpours can occur, maybe in a few days, releasing large amounts of water on the ground. Although the winter in Paraguay is mild, the country, especially in the south, can be affected by cold air outbreaks from May to September (the cold wind blowing from Argentina is called Pampero), which can lead to nighttime temperatures around freezing (0 °C or 32 °F), but sometimes also a little below. In Paraguay, however, snow is virtually unknown, and daytime temperatures are mild even in these circumstances. Throughout the year, Paraguay is also exposed to warm air masses, which can bring warm days even in winter, with peaks above 30 °C (86 °F). During summer, however, the heat is permanent, although it is generally torrid (hot and dry) in the north-west, with peaks above 40 °C (104 °F), and more humid (therefore more uncomfortable) in the eastern and southern regions. As we can see from the mean temperatures of Mariscal Estigarribia, the Gran Chaco is really hot in summer, and it's still warm in winter, at least during the day. In this northern area, as mentioned, the rainfall is lower than 1,000 mm (40 in) per year, and winter is dry. Here is the average rainfall. In the far north, near the border with Bolivia, the average daily temperature rises above 20 °C (68 °F) even in the coldest months, so the climate can be called tropical. 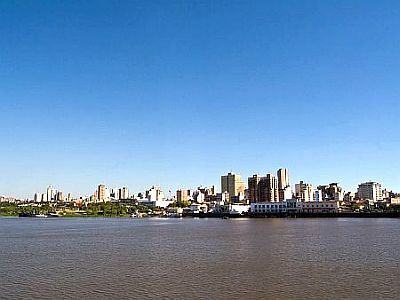 In the capital, Asunción, located in the southwest, a short distance from the border with Argentina, the average daily temperature ranges from 28 °C (82 °F) in January and February to 18 °C (64 °F) in June and July. Precipitation amounts to nearly 1,400 mm (55 in) per year, including more than 100 mm (4 in) per month from October to May, while there's a remarkable decrease in winter, when it drops to 40/50 mm (1.6/2 in) per month. In fact, looking at the map above, we can see that the capital is located in the center of the country, halfway between the north-west, which has a dry winter, and the south-east, which is rainy in winter as well. Here is the average precipitation. Despite the thunderstorms, the amount of sunshine in Paraguay is good in summer, while in winter, sunny days alternate with cloudy days. Here are the sunshine hours per day in Asunción. In the east, the city of Pedro Juan Caballero, being located at 600 meters (2,000 feet) above sea level, is less hot in summer and cooler in winter. In the far south-east, in Encarnación, the temperature is a few degrees lower throughout the year. Here are the average temperatures. In addition, the rains in Encarnación are more abundant: they exceed 100 mm (4 in) per month even in winter, and there is no dry season. Here is the average rainfall. The best time to visit Paraguay is from April to October. In fact, the summer, from November to March, is the sunniest season, but it's uncomfortably hot and there's some chance of thunderstorms: it is probably the worst season. The winter, from mid-May to mid-August, is typically mild or pleasantly warm, and it's the driest season in much of the country, except in the south-east, but sometimes, it can be a bit cold and windy for a few days; in the south-east, and sometimes even in Asunción, weather disturbances in winter can bring some cloudy and rainy days. You may therefore prefer spring and autumn (April to mid-May and September-October), at least in Asunción and in the south, bearing in mind that there is a moderate amount of showers and thunderstorms. In the Chaco, given that there is practically no risk of rainfall in winter, and that spring and autumn can be hot, if you want to avoid the heat you will have to focus on the period from April to August, or even better, June and July, when hot days are less frequent and less intense. In winter (mid-May to mid-August): bring clothes for spring and autumn (light for the day), and a sweater and a jacket for the evening. A raincoat or umbrella for the south. In summer (November-March): bring lightweight clothes of natural fibers, a sun hat, a light raincoat or umbrella, and a light sweatshirt for the evening in the south.